Pharmaceutical R&D labs test new formulations for viscosity to measure flow behavior properties. Viscosity impacts processing decisions for mixing in manufacturing and filling containers with consumer products, in addition to formulation stability during storage, transport, and consumer use. Instruments known as “rheometers” and “viscometers” are used to measure the viscosity of semi-solid materials such as creams/ointments, and pharmaceutical liquids. Viscosity flow curves illustrated in the instrument display characterize common behavior of pharmaceutical products (see Figure 1). As rotational speed of the spindle escalates, viscosity reduces. R&D will choose a data point on this curve and direct QC to test for that value when qualifying production consignments for delivery. Figure 1. 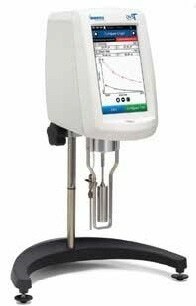 Brookfield DV3T 1 cP = 1mPa*s. Rheometer with Cylindrical Spindle. There are three decisions that R&D makes in arranging the QC test technique. The first is to establish the manufactured material’s viscosity range. Scientific units of centipoise (cP) are commonly used in North America, while other regions of the world use milli-Pascal seconds (mPa*s) as well. Luckily, water is the reference material with a viscosity of 1 cP at 20 ºC. Cough syrups and other medicinal liquids that are ingested are normally below 100 cP. Rubbing ointments could be around 1,000 cP or more. Thick creams can start around 10,000 cP. Selection of viscometer with suitable torque measurement range relies on knowing the material(s) that will be examined. Two standard torque ranges are used for a majority of pharmaceutical products. “LV” denotes low viscosity materials, while “RV” is chosen for “regular” or medium viscosity products. There are options for higher viscosity, such as HA and HB, but these are not frequently used to test creams/ointments and pharmaceutical liquids. After the torque range has been fixed, the selection of an instrument model is predicated on operating features necessary for the measurement. R&D establishes the kind of spindle and rotational speed to use when determining viscosity. Spindles, at large, are either cylindrical in shape, similar to the image in Figure 1, or may contain a disc at the bottom as illustrated in Figure 2. Disc spindles are the most standard type used in QC labs. However, there are other types as well, such as T-bar and cone, but will not be mentioned in this article. Figure 2. Disc-type Spindle for Viscosity Measurement. Other parameters involved in the selection of viscometer include an integrated clock to time how long the spindle rotates before the viscosity data point is noted. If there is a temperature obligation for conditioning the sample, then viscometer should be provided with an integrated temperature probe for verification of sample temperature. Each feature will raise the cost of acquiring the viscometer, so it is crucial that R&D plainly establish all details essential to making the accurate viscosity measurement. The third and final requirement for QC is being aware of the standard parameters for the viscosity measurement to approve the product for shipment. R&D will test many samples during the validation process to determine cP values for the QC test. When measured, viscosity falls between these two and shipment takes place. If the measured viscosity drops outside, then perhaps the instrument is not reading properly. The procedure to determine that the instrument is not flawed necessitates a quick test with a viscosity standard fluid (see Figure 3). The fluid is certified to have a particular viscosity value. Measurement with the QC instrument must come sufficiently close to the mentioned viscosity value to establish the instrument is in proper working condition. At that point, QC must report back the viscosity test. Figure 3. 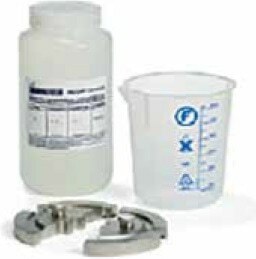 Calibration Test Kit with Viscosity Standard Fluid. Follow these three easy steps in choosing the right viscometer, together with viscosity standard fluid, and your QC Lab will be in good condition. When there is any doubt, it is recommended to go back to R&D for verification of test technique and correct method for conducting an effective viscosity test. 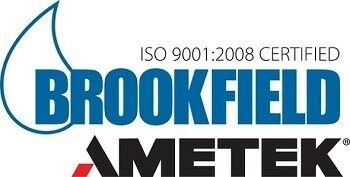 Brookfield, a business unit of AMETEK Inc, is the world leader in viscosity measurement and control of liquids and semi-solids for 80+ years! We manufacture and distribute globally viscometers the AST 100 for advance sensor technology for simple, direct in-line viscosity measurement, DV2T Touch Screen with temperature measurement, rheometers DV3T for measuring yield stress and viscosity, RST Controlled Stress for challenging rheological measurements, CT3 Texture Analyzers which features compression and tension mode for measuring firmness, springiness and chewiness and PFT Powder Flow Testers which measure yield stress and viscosity flow index and arching dimension used in R&D, QC and inline applications for rheological fluid analysis, tension and compression and powder flow analysis. Markets include: food cosmetics, pharmaceuticals, oil & gas, personal care products, adhesives, printing, inks & coatings, paper coatings, chemicals, packaging, plastics, construction materials, and asphalt. Brookfield AMETEK manufacturers and services a full range of viscometers and rheometers, texture analyzers, and powder flow testers. Additional services include: testing for viscosity, texture and powder properties, calibration and certification program, custom fixture development, free technical papers, seminars, videos, application notes, manuals, and educational and training programs.